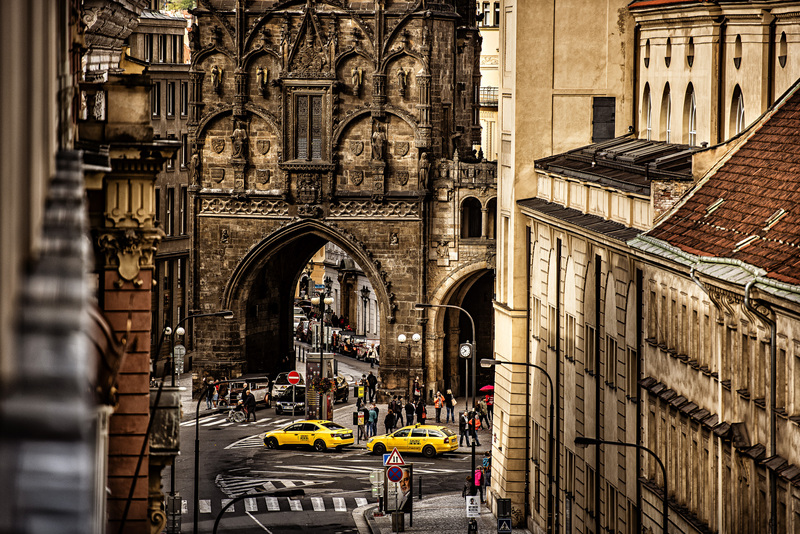 Literally a „Powder Gate“ is one of the most expressive monuments of late-Gothic Prague, and was built in place of the dilapidated original gate named Mountain Gate called Ragged, which dated back to the 1st half of the 13th century. The Powder Tower brought into the town one of the main roads coming from Eastern Bohemia, namely from Kutná Hora. This was also the place where the coronation processions of Bohemian kings would enter the town. 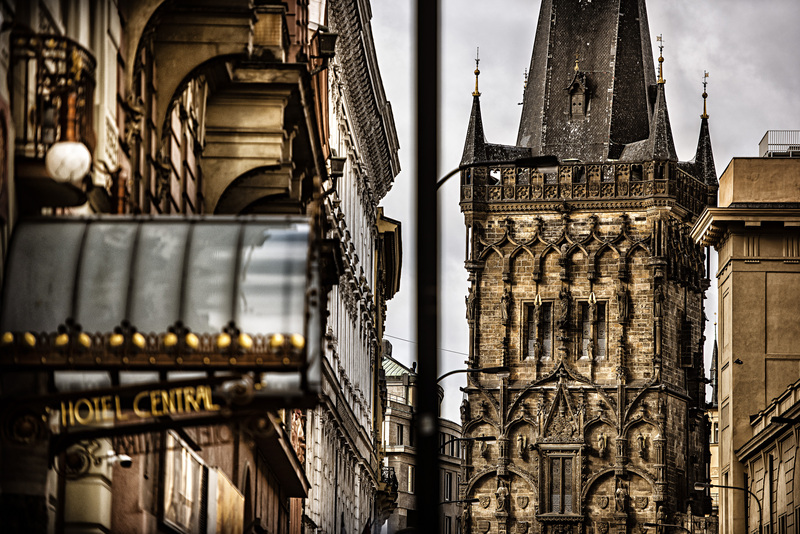 The Powder Tower thus marks the start of the Coronation or Royal Path to Prague Castle. The foundation stone was laid in 1475; the construction was conducted by builder Václav, and later from 1478 on by Matěj Rejsek, who partly also provided the rich sculptural decorations. The tower was founded on the bottom of a fortification moat, approximately 9 m below today’s terrain. Later on, the moat was filled up, and its significance was lost, and therefore the bridge leading to the passage also disappeared. From 1488 on, the gate remained unfinished, probably due to the fact that the royal residence moved from the Old Town back to the Castle. Further construction works were only started in 1592 in an era of mayor Krocín of Drahobejl, when the new entrance was built together with the spiral staircase (still used today). Before that, entrance was only possible via a gallery of the Royal Court (Královský dvůr). Today’s name Powder tower (originally a New Tower) has been used since the beginning of the 18th century, when the tower was used as a gun-powder storage place. In 1757, all the plastic decorations were damaged by Prussian shooting, and they were removed in 1817. In 1823, a clock was installed in the tower, and later removed. 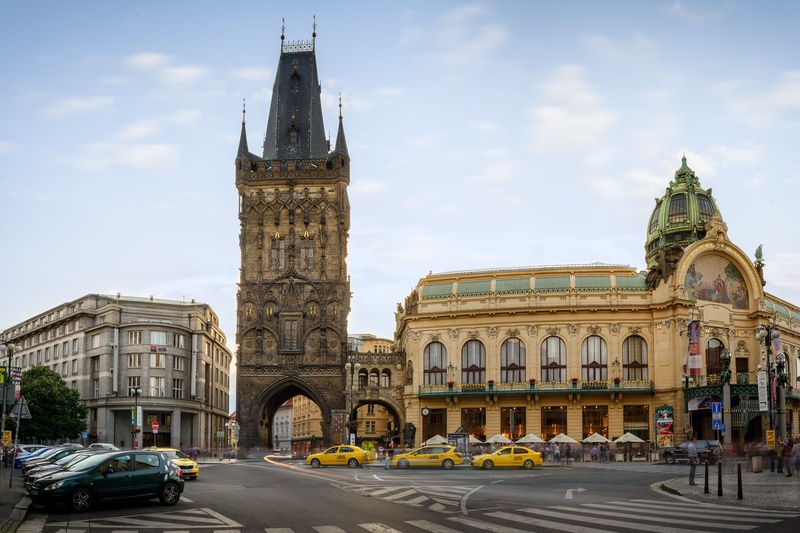 Today’s appearance dates back to the years 1875 - 1886, when the Powder Tower was restored and completed in pseudo-Gothic style by architect Josef Mocker, in cooperation with significant Bohemian sculptors, such as Bohuslav Schnirch and Ludvík Šimek. The first floor was vaulted by the builder via a stellar vault, the second floor then via a net vault. The passage way has a net vault, and the gate is concluded by a gallery and a chisel roof. The first floor is decorated by the statues of Jiří of Poděbrady and Vladislav II on the side of Celetná Street, and by Přemysl Otakar II and Charles IV on the other side. The statues of the kings are surrounded by coats of arms of territories in which they ruled. In the corners, there are allegories of the rulers’ virtues. Above the statues of the rulers, there are angels with wings, and there is a lion with the emblem of the Old Town of Prague on the four corner posts. Statues of Bohemian patrons and saints are located at the level of the second floor, with Christ in their middle on the Eastern side, and Virgin Mary with a child on the Western side. The front leading towards Celetná Street holds the statues of Adam and Eve, and the opposite front holds the statues of St. Peter and Paul. There are emblems of Bohemian royal towns by the battlement. There is a bust of a knight above the Eastern passage way with a band with a Latin inscription meaning: Behold! Prague. For the honest I am a mother, to the deceivers I am a step-mother; let those flee away, and may those who want good come. On the Western side, there is Matěj Rejsek’s bust, holding a band with the following plea in Latin: Dear citizen, forbear the unworthy people living without laws from harming me, a fine receptacle. On the side neighbouring with the Municipal house, there are remains of Gothic plastic decorations depicting slightly scandalous scenes. On the side heading away from the Municipal house, there is a special bay, which used to serve the purpose of a toilet. Slate roof with four corner spires, each 6 m high, is covered with different inscriptions of the visitors by the gallery; the oldest date back to the years 1821 and 1844. General reconstruction took place in the years 1961 - 1963; partial reconstructions of the sculptural decorations in 1992. The Powder Tower is 65 m high, the observation gallery is 44 metres above ground, the spiral staircase is made of 186 stone steps.